05/24/15: We spent the first day of my three-day weekend cleaning the apartment as if we had company coming over. Sweeping, dusting, vacuuming (even moving the furniture first!) and other fun activities. When we were done, Stephie suggested that I go for pizza, which was a perfect way to end the day. 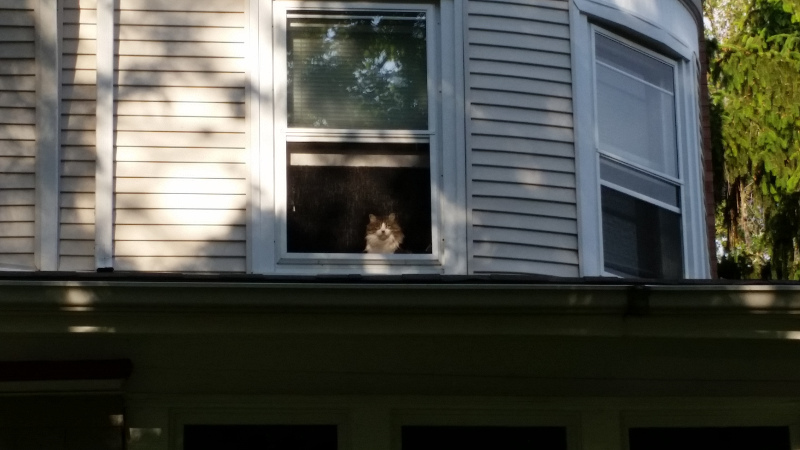 I ran over to one of our local pizza places, and as I was getting out of the car, I looked up at the house to see this. We rarely get to see Billy, the cat who lives upstairs, and I think he likes it that way. They had him out in the yard one day last summer, trying to walk him around a little on a leash, but he was not having any of it. He lay in the grass and kept meowing, as if to say, "I'm done. Take me in!" But we do hear him above us from time to time. Before I saw him in person, I asked my neighbor how big he is, because when he runs across the floor, it sounds like they're rolling a bowling ball! I'm a little sad, though, because I was looking forward to seeing him regularly this summer, now that he has such a terrific spot, but Stephie and I found out this week that our neighbors will be moving soon, having found an apartment in an area where there's more night life and excitement. They were great neighbors and we're going to miss them. I hope Billy has as good a spot in the new place to sit and watch the world go by. I stopped and looked through the tapes on the rack and found all kinds of treasures there. 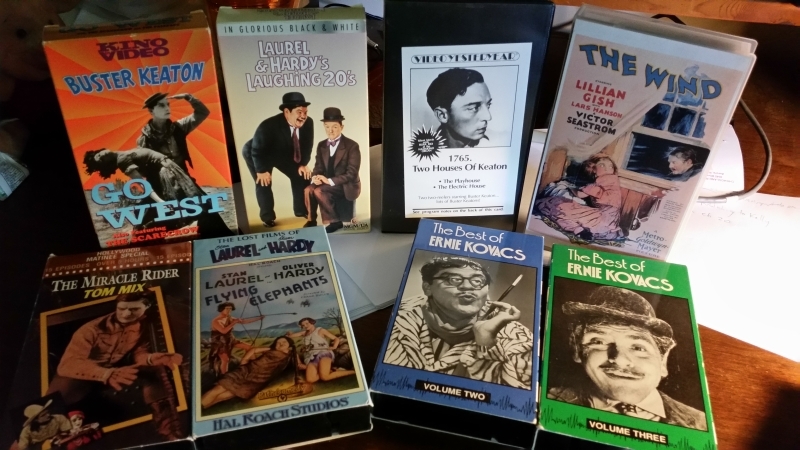 I picked up the two Ernie Kovacs tapes, two Buster Keaton collections, two Laurel & Hardy volumes, one of which has Flying Elephants, a silent that I always wanted to buy on super-8 from the Blackhawk Films catalogs we got in the mail. The tapes were twenty-five cents each, so I also grabbed The Wind, a 1928 Lillian Gish film, and The Miracle Rider, a 15 chapter Mascot serial starring Tom Mix. Not a bad haul for two bucks. Good thing my VCR is still hooked up!